Western Pennsylvania fields are full of them right now—those downy little fluffs of white that float along in the breeze. When we were kids we’d catch them, make a wish, then blow them heavenward in hopes that our wish would come true. What I didn’t know then was that these “wishes” came from the thistle plant. 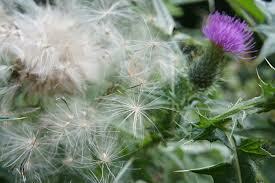 Thistles start out as prickly little landmines for barefooted children. (Scotland adopted this plant as their national emblem apparently because once, in the dead of night, some clumsy barefooted invading Norseman stepped on it, swore quite loudly, and alerted the entire Scottish army that they were under attack. Norsemen later began wearing shoes whilst attacking Scotland.) Thistles grow a cluster of slender thorny stalks with equally nasty leaves and later produce the iconic regal purple flower out of a pear shaped green base. Almost immediately after it blooms, the plant starts to die. Its leaves and stalk turn a gnarly brown and as the dying plant dries up, birds ravage the flower yanking out the featherlike thistle down to find seeds. If I’m honest, my life feels like that sometimes. I’m prickly, sour, and resistant with brief moments of beauty. And I have a pear shaped base. Life is hard and there are too many annoyances that peck and pester and try to pull away all that seems precious. 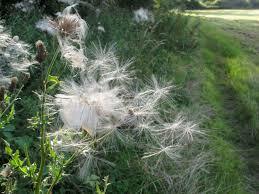 But how wonderful to think that every thistle holds a thousand wishes! Your life, your marriage, your job, and your journey may look half dead. You might be a dried up mess of thorns, but you too hold a thousand promises. Only after hardships do we bear real fruit, only in death does the thistle share all that was waiting inside.